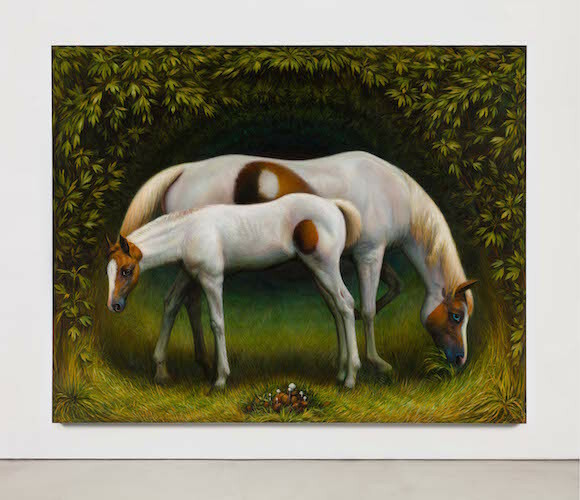 TM Davy, horses (xoo), 2016, oil on linen, 79 x 99". TM Davy’s suite of eight horse paintings comes from a blood connection to this gallery’s street address—the artist learned of his patrilineal great-great-great-grandfather’s livery stable via an old photograph that had “195 Chrystie Street, 1880” scrawled on its back. Three large canvases of equine bodies stand in the front gallery. One, horses (xo) (all works 2016), shows a mare and scared-looking foal bathed in a rainbow of colored light that streams in from the window of a claustrophobic stall. This otherworldly halo appears in horse (x) as well. Davy has long held a fascination with light, often depicting it, like a Dutch old master, as a painting’s greatest subject. Everything from the horses’ breathing skin to their genitalia is lovingly rendered. Their eyes are crushingly realistic: exceedingly anxious, watchful of being watched. In the rear gallery are two paintings, horse (xoox) and horse (xox), where the horses’ eyes are covered with soft fly masks—admittedly, a welcome reprieve for the viewer. Human evolution is closely tied to the ways beasts of burden have been used and, of course, misused. Horses—sometimes jumpy, sometimes gentle—can be ignorant of their own size and strength. The work horses (xoo) depicts another mare and foal grazing beneath an archway of leaves; it’s such an idyllic moment of painterly symmetry. In this serene setting, they look out at the viewer. You experience discomfiture at this, for these noble, enigmatic creatures seem to understand, profoundly, that this very moment of being looked upon is the only instant that exists.